No special effects necessary. 3D not required. No car scene demanded. The focus is on character, feelings, life lived to its fullest, and the people who populate the world and make it all worthwhile. Having seen Transformers: Dark of the Moon just five days ago, a loud explosion laden special effects extravaganza with a budget of $195 million, it is startling to return to a film with a budget of only $3.2 million which was more real, more profound and more touching on all levels. This movie was written and directed by one Mike Mills, but what's interesting is that the story is his story. Mills' father, at the age of 75, five years before his death, comes out and declares that he is homosexual. Ewan McGregor plays Oliver, the son, while the father, Hal, is played by Christopher Plummer. The film tells its tale in three different periods. First, just after the death of his wife from cancer when Hal declares he's gay through the next few years until he too dies from cancer. Second, there's the period after the death of Hal when Oliver must contend with the death and get on with his own life. Finally, with flashbacks to family life when Oliver as a young boy was in the midst of a family which had a strange secret. It is important to remember the period of time when our society not just frowned on homosexuality, but would ostracize anybody who was outted. During the film, we are told of when Dad visited a psychiatrist during the 1950s and was told his homosexuality was an illness and could be cured. Apparently Mom knew her beau was gay but she married him anyway probably with the same idea as the psychiatrist, that is, with some good loving from a good woman he would be cured of his homosexuality. From there, family life is portrayed as somewhat distant between man and wife, much to the dismay of the wife. I have seen Mr. Plummer several times in the past few years and this gentleman, this actor is absolutely phenomenal. He is going to be 82 on December 13, 2011 and while others may be in rest homes, he is still going strong on stage and in film. In this film as Hal, he is quite charming and also quite convincing as an out of the closet gay. Six months after the death of his wife, after a marriage of 44 years, Hal declares that he's gay. From that point onward, Hal is shown living life as though he has thrown off the shackles of a lie which had kept him in check all his life. Father has a Jack Russell terrier called Cosmos. After Dad dies, Cosmos goes to live with son Oliver and makes for an interesting sidebar to the story. While the dog doesn't talk, the film quite amusingly puts some subtitles on screen to represent what the dog is supposedly thinking. I found this to be a novel addition to the filmed story. No special effects necessary. This is a small film but an excellent one. You don't need a budget of $200 million to make a good film as any good film is based on a good story and this is a good story with great actors. I thoroughly enjoyed this but I have to add that being older like yours truly, your taste in what's good changes somewhat. A little character development and a logical plot are not just nice to have, they are mandatory. The music set the right tone for the film and reminded me so much of Woody Allen's latest, Midnight in Paris: the same flavour, the same closeness, the same intimacy with the characters of the film. Beginners is a very good film even without 3D. Beginners is a 2010 American comedy-drama film written and directed by Mike Mills. It tells the story of Oliver (Ewan McGregor), a man trying to deal with two stunning revelations from his 75 year-old father Hal (Christopher Plummer): that he is gay and gravely ill. The film is based on the true-life coming out of Mills' father at the age of 75, five years before his death. 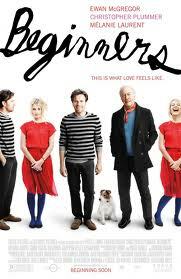 Beginners premiered at the 2010 Toronto International Film Festival, where The Los Angeles Times heralded it as a "heady, heartfelt film" with a cast who has "a strong sense of responsibility to their real-world counterparts".